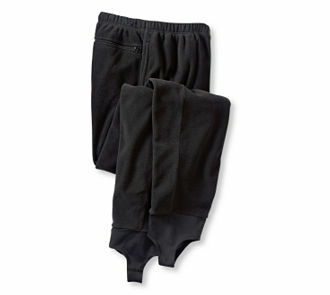 Even on a warm day, you may find yourself needing some fleece fishing pants to keep out the chill of the river. Some of them can be pretty icy, even in the height of summer due to snow runoff from the peaks. If you prefer to fish in the early dawn or on cooler days, they are a must! These warm, comfortable layers can mean the difference between an enjoyable fishing trip and one spent shivering and miserable. Be sure to have some along just in case. There is nothing worse than looking forward to your fishing trip, only to get there and have no way to stay warm and comfortable. 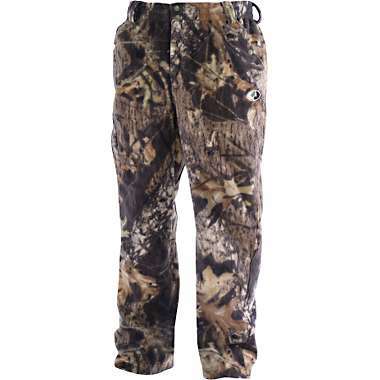 The purpose of these trousers is to provide you with a windproof, breathable barrier that also protects you from the chill of the water pressing on your waders. Fleece fishing pants are made of 100% polyester with a comfortable elastic waist. Stirrups or ankle cuffs keep the pants securely in place around your ankles, so they don't ride up when you put on your waders over the top. The polyester fleece not only keeps you warm, but it wicks away moisture. Depending on where you plan on fishing, and under what conditions, you'll be able to choose the appropriate weight of fleece. Lightweight fleece is appropriate for cool summer mornings, while heavy fleece will keep you warm and toasty in much colder situations. When choosing fleece fishing pants, be sure to check the quality of the seams. They should be well-sewn and finished without extra threads. Choose fleece with a non-pilling surface to help wick away sweat and moisture and spread it over a wide surface for fast evaporation. Only choose top quality fleece, so they will work well with Gore-Tex waders. Find fleece that has a little stretch in it for the most comfort. Be prepared to spend between $25 and $100 for a good pair of fleece trousers. Price will vary slightly depending on the thickness of the fleece and what additional amenities are on the pants. For the price, you'll be getting warmth, breathability, and mobility. The exterior should be smooth, either nylon or lightly brushed, so you can slide easily into your waders without friction, and so the pants will not ride up. The interior should be soft and lofty to provide you with a lifetime of wicking performance. Zippered back pockets will keep your valuables safe while you fish. Side seam pockets are included for other needed items. Some styles also have snapped cargo pockets on the sides. A zippered fly makes the pants easy to wear. Most companies make a variety of sizes, ranging from regular to 4XL, as well as tall sizes. Be sure and try them on. The elastic waist allows for a wide range of fits. For example, the 4XL can comfortably fit a waist from 49 inches to 66 inches. Tall sizes are usually 4 inches longer in the inseam than regulars, which run close to 34 inches. Ankles may be kept in place by stirrups, elastic cuffs, zippered closures, or draw strings. Some styles feature articulated knee construction and a gusseted crotch. You may also find some that have an adjustable cinch on the side of the waist to create a custom fit. There are a variety of colors to choose from, depending on the company that made the pants. Usual colors include black, gray, brown, and camouflage. Don't forget to take a look at matching jackets to keep your upper body warm as well, especially if you fish during colder seasons. On the other hand, if you fish during hot weather, you may just need a little wicking action to help with the heat. Similar to the fleece fishing pants, polysilk pants will keep you comfortable beneath your waders or for staying comfy in camp.